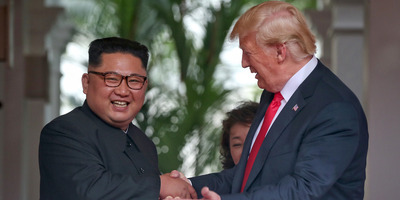 GettyNorth Korean leader Kim Jong Un and President Donald Trump. President Donald Trump says he’s shelving the idea of a second summit with North Korean leader Kim Jong Un until after the midterm elections. “I just can’t leave now,” Trump said to reporters on Tuesday. The November election is expected to a pivotal moment, both in Trump’s presidency and in both the Senate and the House of Representatives., because Democrats could flip a number of seats currently held by Republicans, potentially reclaiming the majority. Trump had positive words about Kim after his June summit with the North Korean leader in Singapore. The president said the second meeting could happen at his Mar-a-Lago estate in Florida. President Donald Trump says he’s shelving the idea of a second summit with North Korean leader Kim Jong Un. Earlier on Tuesday, Trump touted what he called “incredible” progress on US-North Korean relations, as evidenced by Secretary of State Mike Pompeo’s recent trip to Pyongyang – his fourth trip since becoming secretary of state. Trump held his first meeting with Kim in Singapore on June 12, marking the first summit between a sitting US president and a North Korean leader. While Trump described Singapore’s summit as “great,” he floated the possibility of hosting the second meeting in the US, including his Mar-a-Lago estate.